Cowboys have made an enduring mark on the American popular imagination, but not every cowboy is a buckaroo. Buckaroos represent a special part of cowboy culture, which has its roots in Spanish and Moorish (Islamic) tradition. The Spanish introduced the el rancho system to Mexico and conscripted mestizos, Indios, and Africans as workers. The ways of those early vaqueros, who followed the Spanish tradition of herding cattle from horseback, spread across Mexico and the American southwest. Vaquero (Spanish for one who works with cows—vacas) was eventually anglicized to buckaroo. Today, buckaroos work almost exclusively from horseback and are renowned for their extensive horse training methods. 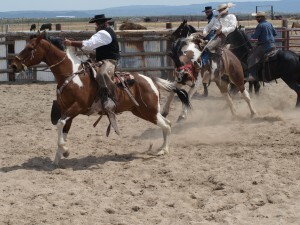 Buckaroos breaking an untrained horse. Photo courtesy of Douglas Manger (click to enlarge). In the mid-19th century, vaqueros moved into Great Basin (parts of Nevada, Idaho, Utah, California, and Oregon) to work on large ranching operations like cattle baron John Devine’s Whitehorse Ranch, which is located in present day Malheur and Harney counties. The buckaroo section of the Great Basin was highly diverse with early settlers coming from Germany, France, the Basque provinces of both France and Spain, Mexico, Ireland, and England. Many Native Americans (including Paiute, Klamath, and Shoshone) also became the first buckaroos. Knowledge of the original vaquero traditions has been passed down through families and by enthusiasts who have taken the time to study these techniques and integrate them into their lives as working ranchers and horsemen. Buckaroos use custom handcrafted gear, including traditional saddles featuring intricate leather- and silverwork as well as braided mecates (ropes) and reatas (lassos). Buckaroo-style gear and horsemanship are becoming popularized in other parts of the country but are at risk of dying out in the remote communities from which they originate. However, some of the most vibrant examples of buckaroo artistic traditions are to be found in rural eastern and southern Oregon. 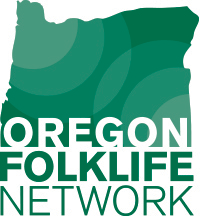 Funded in part by the National Endowment for the Arts, the Folklife Survey of Southern Oregon enabled OFN’s contracted fieldworkers Douglas Manger and LuAnne Kozma to document the artists in this exhibit. Like their creators, each of the featured pieces is a unique blend of hard work and artistry. Contact ofn@uoregon.edu to learn more or if you have information about diverse vaquero, buckaroo, ranching, or other occupational traditions in Oregon! Buckaroo Traditions of Oregon celebrates the continuity of occupational traditions in rural Oregon and encourages audience understanding and appreciation of art forms arising from ranching practices. The exhibit includes examples of vaquero and buckaroo traditions and field photography from the OFN's Folklife Survey of Southern Oregon. Vaqueros mural in Vale, OR by Colleen Mitchell-Veyna. This was made possible by the Mexican-American Citizens League. Part of a series depicting important cultural groups in southeastern Oregon.